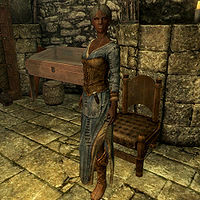 Sayma is a Redguard general goods merchant who runs Bits and Pieces in Solitude. She is married to Beirand and they have one son, Kayd. Sayma lives the life of a busy merchant. She wakes up at 8am, and will open up the shop for business. She spends most of her time behind the counter ready to deal with potential customers, but will sometimes move to the nearby chair for a quick bite or drink. After twelve hours of dutifully serving customers, she will leave the store and head toward the Bards College. She will stand outside the entrance to the Bard's College for two hours, usually in the company of Illdi and Greta. She will head home at 10pm, where she will spend two more hours wandering around the house and occasionally talking with her husband about the dwindling amount of business at the store. She will then head to bed at midnight, where she will sleep for eight hours. Sayma wears farm clothes and boots. She carries her key to the store and a selection of common items and gold. In combat, she relies on an iron dagger. Sayma will greet potential customers with, "Welcome. Look around. We've got everything you could want in life. At least... that's what Beirand always tells me." or "Welcome to Bits and Pieces. I'm sure you'll find what you need here." After finishing a transaction, she will urge you to "Come back to Bits and Pieces anytime." or "Make sure to recommend us to your associates." She will comment to you about the recent execution saying, "Beirand said you got here just before the execution. Must have been a lovely first sight." If you ask her if she was at the execution, she will reply, "No. That was an ugly affair. High King Torygg's death has turned the whole town on its head." She will then continue on, giving you her opinion on the king, "And between you and me? He wasn't even that good a king. All of those rambling speeches about the Empire this, and the Empire that.." She will also observe something familiar in you and say, "Hmph. You know, you've got a certain... fire in your eyes. Just like my Beirand. Please, feel free to look around. We've got a bit of everything." If you ask just who this Beirand is, she will reply, "Beirand's my husband. He works the forge up at Castle Dour. I barely see him nowadays, what with him filling orders for the army." Sayma: "Sure has been quiet around the shop lately." or "We hardly ever get any new customers anymore. ", then "I suppose in wartime, people aren't looking to part with their old junk." or "Not that I mind the break of course, but still." Beirand: "It's okay, dear. More work than ever down at the blacksmith." or "We'll make it through, dear. We always do." Due to there only being two beds in Bits and Pieces, Sayma may not be able to sleep if Beirand and Kayd beat her to bed. She will wander around the house all night long if no beds are available. This issue has been addressed by version 1.3.3 of the Unofficial Skyrim Patch; one of the single beds is replaced by a double bed. Her dialogue will be slightly different if Beirand is not alive.